Will nuclear WAR begin over the Berlin Crisis? That fatal question can be answered only by those who know both the facts and Biblical prophecy! 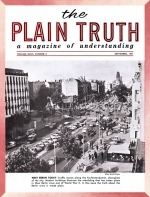 Read this shocking, on-the-spot report by the Executive Editor of the Plain Truth! West Berlin, Germany: Will the world be plunged into a super-destructive hydrogen bomb WAR this November? Nikita Khrushchev, slamming his hand on the table to President Kennedy's face, said. "If the United States wants war... force will be met with force!" Khrushchev threatens Russia will NOT COMPROMISE on Berlin. She will sign a separate peace treaty with the East Germans unless the Western powers agree to Russia's terms before the November deadline. Kennedy maintains the West will stand absolutely firm, opposes the Russian plan, says the Western allies will not withdraw from West Berlin. Think of it!